If you are looking for a walking holiday in Tasmania you can't go past Maria Island on the east coast of Tasmania. Mountainous in the interior and surrounded by stretches of beautiful white sandy beaches, aqua waters and limestone cliffs this island is a hidden gem unknown to many. Enjoy the three days Maria Island Walk with your overnight bags carried for the entire journey leaving you free to soak up the spectacular scenery, admire the rich and abundant wildlife and take in the intriguing history. Owner Mark Norek says "Maria Island holds a special place in my heart, I proposed to my wife Vicki on the top of the island's Bishop & Clerk summit. This island is pure heaven and has everything you would want in a walking holiday including spectacular scenery, abundant wildlife and so much natural beauty, it's one of Tasmania's little gems that is unknown to many Australians. I'm very passionate about sharing the secret of this magical place with our guests". Our team is dedicated to providing our guests with an enriching experience and quality and interpretive tours. Our group sizes are small and intimate with a maximum of 10 people, we find this delivers a more personalised service, a great social environment and has less impact on the environment." We will carry your overnight bags every day! Life's An Adventure's will carry your overnight bag for the entire Maria Island Walking Tour. 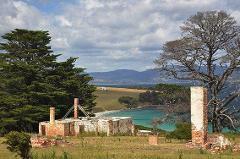 Maria Island 3 day guided walks are for those looking for a walking and camping experience with the creature comforts! Travelling with us, you can enjoy a Maria Island Walking Holiday where all the organisation is taken care of for you, from carrying your overnight bags every day, to setting up camp and cooking delicious dinners featuring wonderful Tasmanian produce, wine, cheeses and more. On night one you will step back in time and become a convict for the night. Our accommodation is at the convict Penitentiary built in the 1830's at the world heritage settlement of Darlington and refurbished with comfy bunk beds and woodfire heaters. Dine under the stars enjoying delicious meals. Whilst on night two you will enjoy camping on the southern part of the island at Encampment Cove. Enjoy camping in walk-in touring tents with off the ground beds, deluxe mattresses and hot showers.